No lambs for me this year, much to my disappointment, if not surprise. Rick got his ultrasound machine out this morning to check something on my horse, and agreed to peek inside Valentine while he had it set up. At just four weeks from her due date, we should have been able to see SOMETHING if she was pregnant, but nothing showed up except intestines. 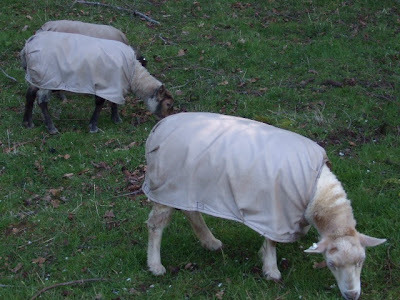 Since she has not been growing "great with (lamb)child," the most I was expecting was one, but not even a single is hiding under that silvery fleece (temporarily uncoated for her "doctor's" appointment). Yes, I'm sad. 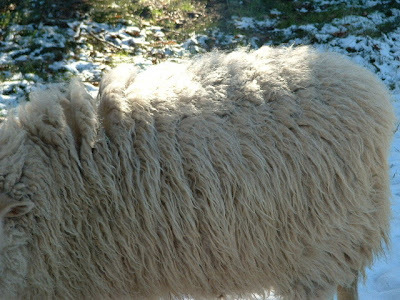 Valentine has such wonderful fleece and personality, and I had full confidence in Lois' judgement of suitors for her. I was just sure her ram lamb would be a good sire to use on my other girls, and the ewe lamb would be so nice I'd have to sell Rechel or Bella to make room for her. But there will be other years and other chances for my sweet Valentine to produce her own little valentines for Boulderneigh. This year I accept the challenge of finding the "perfect" ram to court all four of my girls this fall. I never intended to breed all four of them the same season; ask me if I'll ever do it again a year or so from now! This is how Brian and I ended our day before coming inside for bedtime. 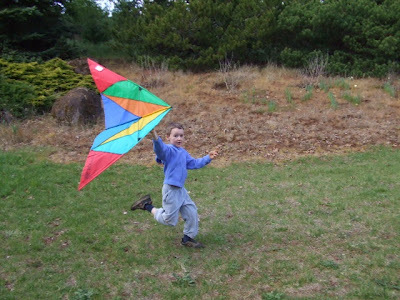 Yes, it was finally windy enough to give Brian some practice at REALLY flying his kite, and it was wonderful! Today was spent, as Sundays often are around here, working hard in the great outdoors. I did some weeding, pruning and watering; Rick mowed the grass. We hauled several loads (LOADED with earthworms!) 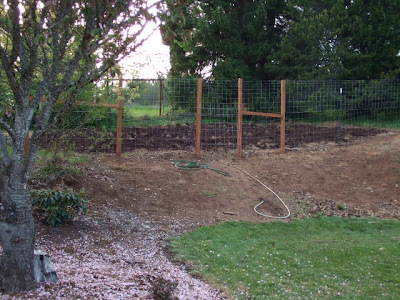 from the manure pile to the garden, then Rick plowed it under. It was too wet to rototill; that will have to wait. 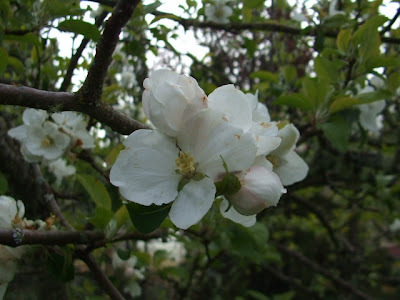 If the weather cooperates, we might get our garden in earlier than usual - hurray! The story sounded plausible (on another continent) and the photos were graphic, but I've been "had" by such things before. so I dutifully visited snopes.com to check out the truth of the matter. Yes, those are undoctored photos of a VERY large African rock python. And while it hadn't been eating sheep, an adult impala ewe was found inside the dead snake, so it was definitely capable of swallowing one of my Shetlands. EEEEECK! Last night I finally slowed down long enough to sew on the strap end of the tiny bag, so I can present to you (drum roll, please!) 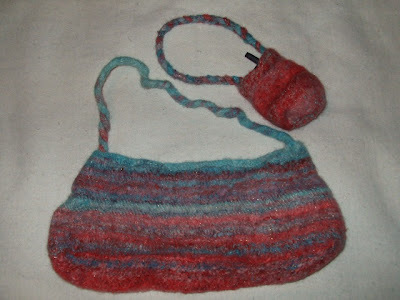 my first felted handbags! 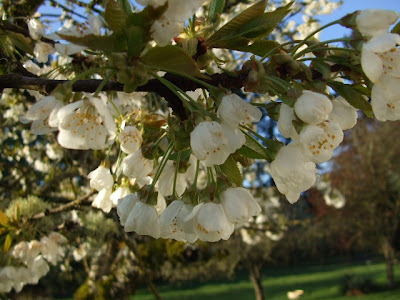 The petals are falling from our double-flowering cherry, littering the ground below with pink confetti. (No, Rosie the bulldog isn't "the beast.") 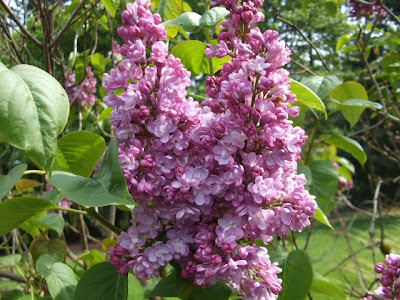 Meanwhile, other flowers are at their peak, like the lilacs. We have an "old standard" and one blushed with more pink. 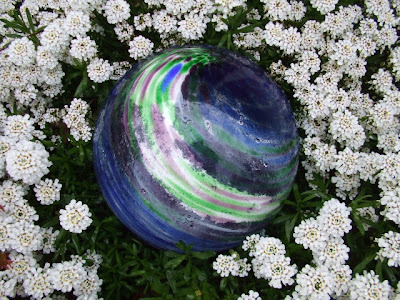 The iberis sempervirens (candytuft) in the front bed is still going strong, surrounding my pretty gazing ball. 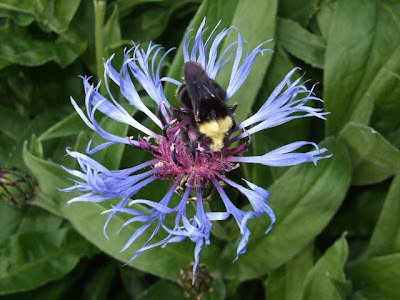 I don't know the name of this blue beauty, but that doesn't matter to the bumblebee. 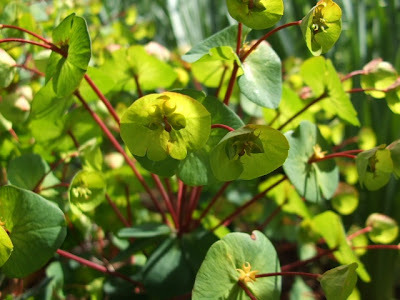 These strange green blossoms belong to the Despina euphorbia planted on either side of the gate in front of the red rhodedendron. In spite of the beauty, the great outdoors was not a very inviting place to be today. There was a beastly, jarring noise emanating from the lot to our south, where a new house is being built. I could see a big trackhoe moving around, but that didn't explain the decibel levels. Even in the house with the doors and windows shut, I could hear a steady, nerve-fraying drone. When it continued past 6:00 p.m., I finally went next door and investigated further. 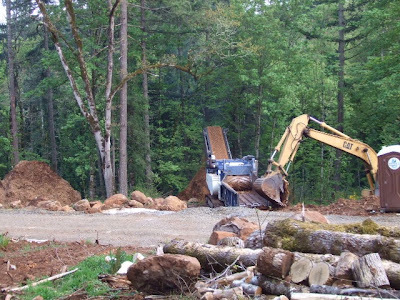 That trackhoe was loading stumps of full-grown trees into a monster chipper/shredder, which had produced two piles of "mulch" the size of small mountains! Grrr; so much for the peace and quiet of country living. I just took a bunch of prize-winning (trust me!) 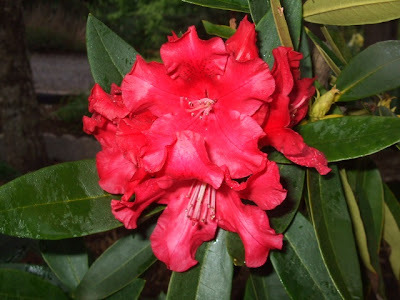 photos of flowers around our place to post here. 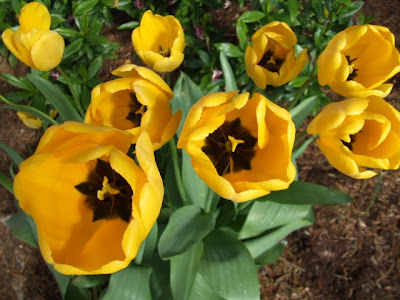 Yes, I know that some of my friends and blog-watchers are tempted to envy our beautiful abundance, and maybe there's a wee bit of my subconscious that likes to gloat, although I tell myself I just like to take close-up photos of pretty things in nature. But when I put my memory card in my printer to upload said photos to my computer, it was empty. Hmm, perhaps I'm being chided! Or maybe it's just the "animosity of inanimate objects" (a favorite quote from a favorite author, Madeleine L'Engle; I think from her book "Walking on Water: Reflections on Faith and Art"). Guess I'll have to go out and try again. Today I hauled my horse to get a lesson from Suzan, my wonderful, talented instructor who has helped make me the fairly successful dressage competitor and trainer that I am. Suzan would probably have been riding in the World Cup competition last weekend in Las Vegas if she hadn't chosen the broader life that includes marriage and kids. 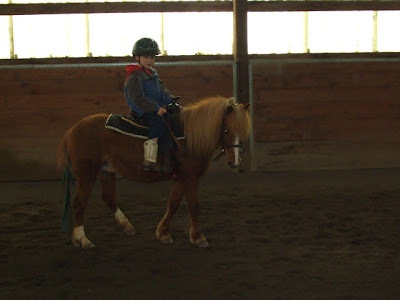 Her daughter has a pony, and the last time I rode with her she told Brian he was welcome to ride Tabby any time he comes with me. 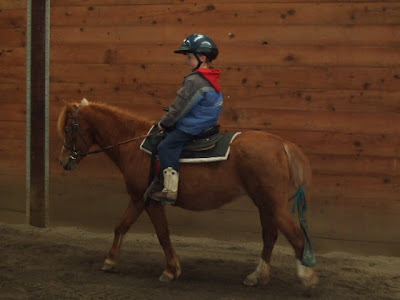 Brian remembered that, so we left early enough to tack up Tabby as well as my horse Russell. 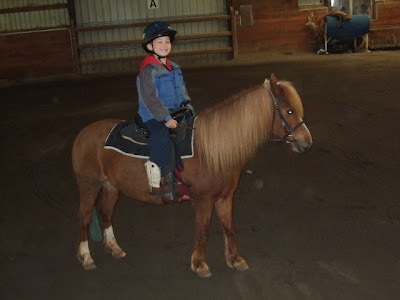 Brian LOVED riding Tabby - can you tell? 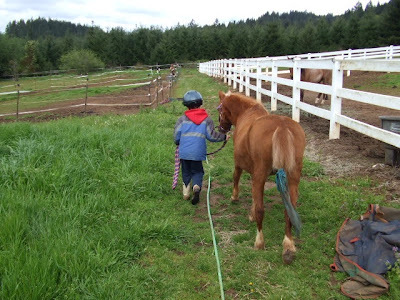 And then he led her back to her pasture. I foresee many more trysts between Brian and Tabby. I didn't get any photos of my fleeces being judged, but Franna was nice enough to send me these today. From top: Valentine's wonderful output; that's yours truly in the jean jacket trying to catch the judge's every word. 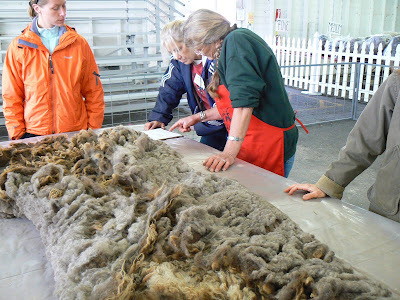 The judge explaining that there is very little difference between the inner and outer coats of Valentine's intermediate-type fleece. 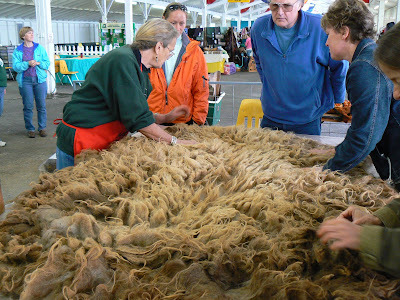 The judge dictating final comments before Valentine's fleece is rolled back up for bagging. I sure hope I can do this fleece justice! Friday morning I got up early and drove north to Puyallup, WA for the Shepherd's Extravaganza. 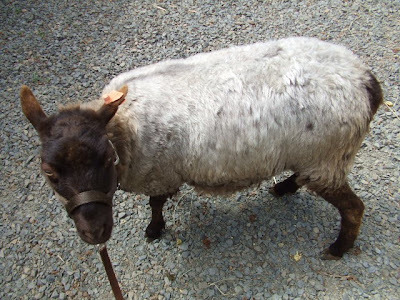 Thanks to Shetland breeder Franna Pitt, a specific breed was featured for the first time - Shetland! 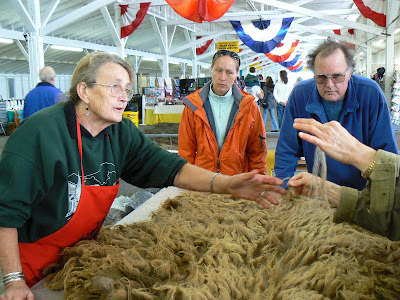 With Franna's encouragement and assistance, I entered my four fleeces and volunteered to help so I could get up close and personal with each entry and hear what judge Ingrid Painter had to say. It was a great experience. 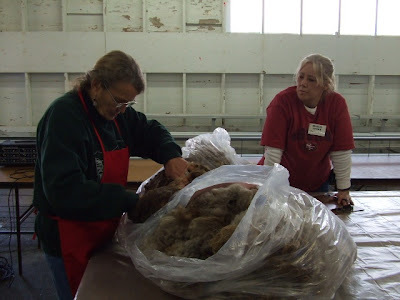 There were 39 Shetland fleeces entered - including two of Linda Wendelboe's from Canada! 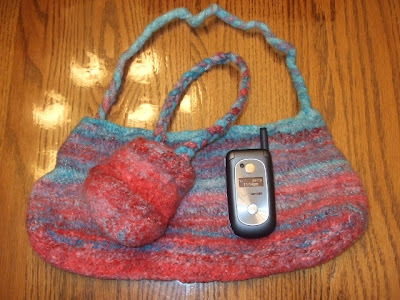 One of hers was a lovely pewter fleece, a rare modified color. 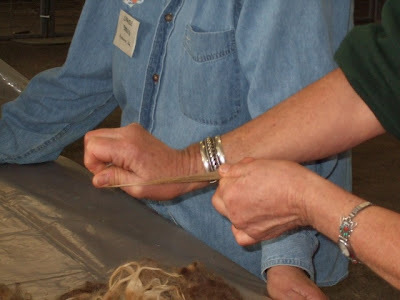 I got to play "touchy-feely" with it and all the other Shetland fleeces, striving to educate my hand and eye while listening to the judge's comments. 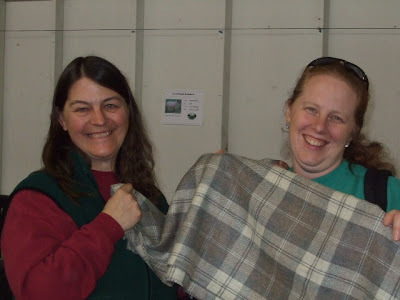 This is Franna Pitt, left, and Donna Schoonover holding the NASSA Tartan. 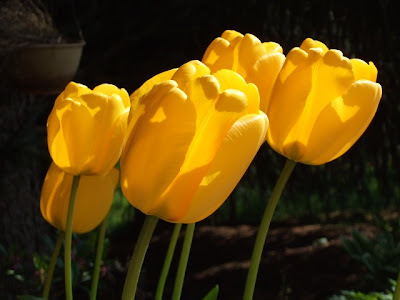 Our glorious yellow tulips are planted just outside the side door of the garage, but the deer still discover them sometimes. 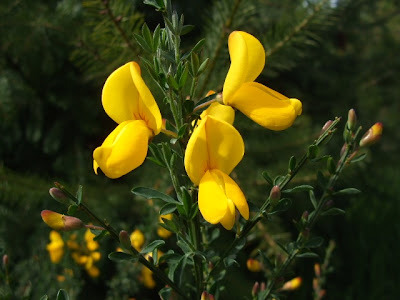 Not this year, fortunately for us. 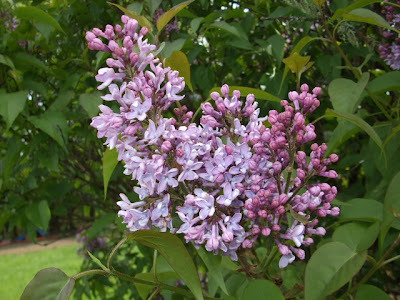 Their golden beauty is a treat for the eyes, and the daphne odora in the same bed is a treat for the nose. Heavenly! 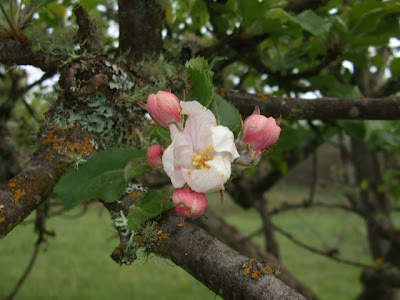 Some of the blossoms on Boulderneigh aren't as "well-endowed," but they promise good things to come. 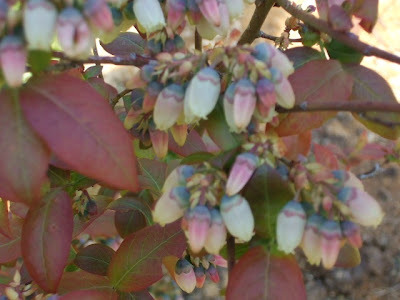 We're dreaming of cherries, pears, prunes, apples and blueberries (raspberries, too, but they are new and not blooming yet). Here are three of the girls enjoying some green grass. Wonder where Valentine is? 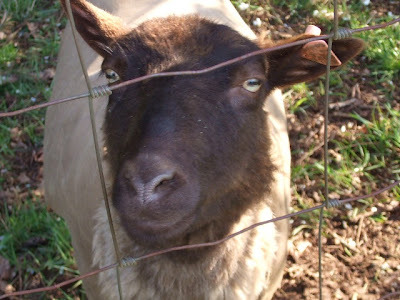 Right in front of me, begging for attention or hand-picked grass from MY side of the fence. Spoiled little sweetheart! 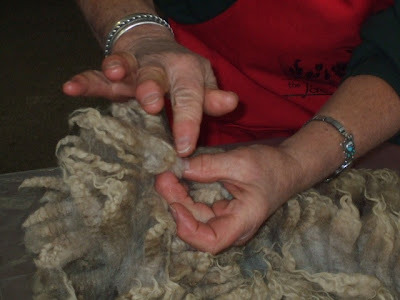 Tomorrow: hours on the road and a Shetland fleece tutorial! This evening when I got home from running errands, there was an unexpected box at my front door, a box labeled "Live Plants" from FTD. Opening up the gift card under the packing label, I read, "In warm remembrance of your dear friend, Joan. 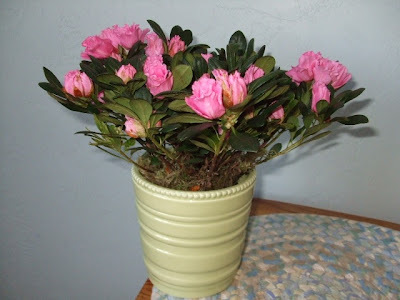 Tina & Kathy" Inside the well-designed packaging was this lovely azalea, which graces our dining room table now and can be transplanted outside later for many years of pleasure. Such a warm, thoughtful, unexpected, humbling gesture of love! Thank-you, dear friends, from the bottom of my heart. 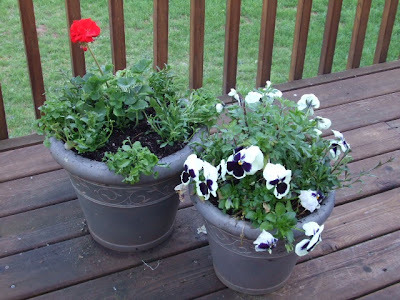 One of today's projects was putting these new plants in pots and the ground. 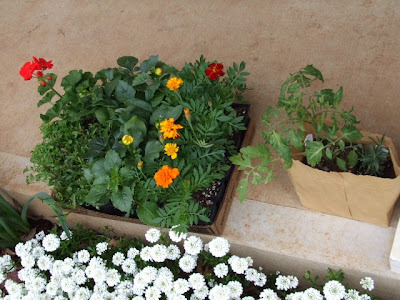 When we went plant-shopping Thursday Brian wanted all the red flowers he could see; he finally settled on the red geranium and the mixed marigolds (can you guess his favorite colors?). I got some trusty dwarf dahlias to go with the marigolds in the entry island; the deer don't touch them and they bloom all summer. Then there's blue and white lobelia to go around the red geranium in a pot on the deck. The garden is not at all ready yet to be buying tomato plants to set out, but I knew if I didn't grab an intriguing "Green Grape" while I could, they would be gone. Here's the completion of our work: the pots (the pansies and chrysanthemum overwintered; I tucked a couple of the lobelia in with them) and the island. The bedding plants will take awhile to fill in around the edge and there's still some weeding to do. The daffodils featured earlier in the blog are on the other side of the little wooden gate at the far end. 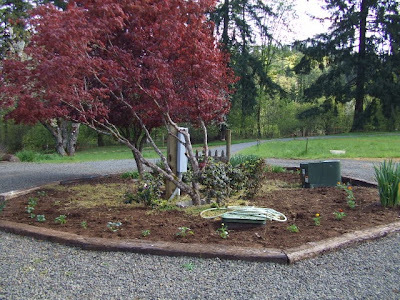 The "Arp" rosemary I planted earlier are around the big green box on the right, and you can see the PJM rhodies Rick planted around the Japanese maple. 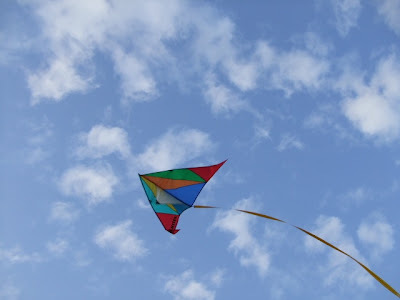 Another of today's goals was the maiden launch of a kite the neighbors gave us. Brian has been impatiently waiting for an opportunity, but today was as still as can be. Undaunted, he made his own wind by running! 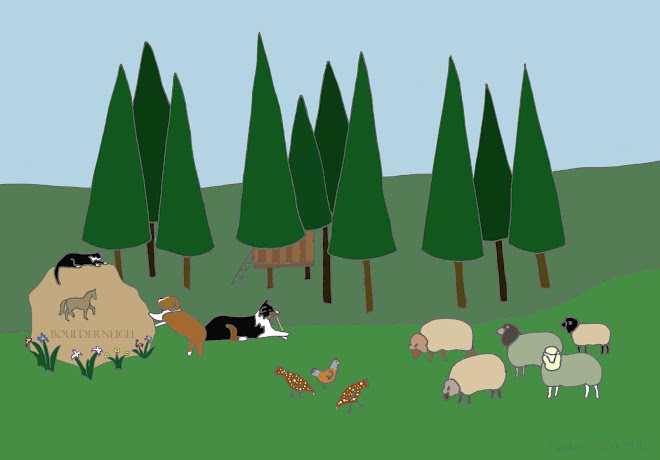 After spending several rainy days in the fold, the sheep-girls got to enjoy the great outdoors today. They are busy growing plush new fleeces; it's interesting to observe the differences between the four. Right now, Bella's and Dinah's seem the most similar in type; Rechel's is crimpier and Valentine's is completely unique and hard for me to describe. They sure enjoy it when I reach under their coats and give them a brisk scratching!